For beginners, the easiest and most reliable way to measure leaf tea is to weigh it. The ratio of leaves to water for most tea is 3-5 grams for six ounces of water. In time, when you gain familiarity, you will be able to determine by eye and touch the amount of leaves to use for a cup or a pot of tea. As mentioned above, tea leaves come in diverse styles and leaf sizes so it’s difficult to measure by volume. Some teas are very fluffy and have more volume, while others, like compressed tea, are very dense and tricky to measure properly. Therefore, it is important to measure by weight and not by volume. Water brings out the aromatics and nuances in tea, so the better the quality of the water, the better the result. Mountain spring water is the best choice, followed by purified water. Tap water that has been treated with chlorine will affect the taste of the tea and should be avoided. Never use distilled water. - The more delicate the leaves (the lighter the color), the cooler the water should be. - The more oxidized the leaves (the darker the color), the higher the water temperature should be. The steeping time depends on the tea, the ratio between water and tea, and one’s personal preference. Common sense dictates that the more water you use, the longer the steeping time. However, if this is causing you to over-steep your tea it’s a better idea to add more tea than increase the time. 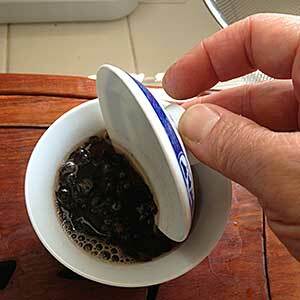 Conversely, decrease the steeping time if small brewing vessels are used. There are teas that can be re-steeped multiple times, such as heavily oxidized oolong and Pu-erh. You should increase the steeping time for these teas with each subsequent steeping. • Always decant the tea once it reaches the desired strength. Leaving the leaves in sitting in water will cause the tea to be over-steeped. • Heating the water in a microwave oven is not recommended because the water temperature is usually not hot enough, nor is the temperature distribution even. • If your water is too hot, simply remove the lid and let the water cool for a couple of minutes. • Water should be boiled only once. Reheating water that has come to a boil and cooled completely will create flat-tasting, lifeless water. Only boil the amount of water that you will need at a given time. • Experiment. Take notes. Remember, practice makes perfect. Pu-erh is best brewed using a small Gongfu style teapot (150 ml to 250 ml) or a three- piece gaiwan and brew it for a short time. This method extracts the flavor from the tea leaves slowly, allowing the tea leaves to remain flavorful, even after multiple infusions. 1. 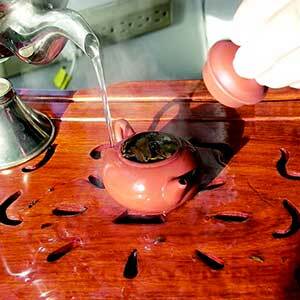 Pour water into the gaiwan, pitcher and cups in order to heat them up. 2. Pour out the water. 3. Place your tea into the gaiwan. 4. Add water to the gaiwan and, using the underside of the lid, toss the leaves in the water gently for a few seconds in order to saturate all the leaves. 6. 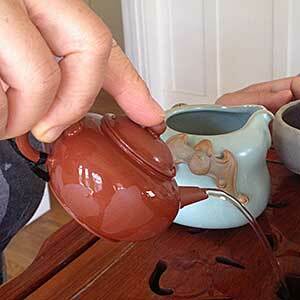 Add water to the gaiwan and, like earlier, mix the leaves gently for the appropriate amount of time. 7. When you are ready to pour out the tea, place the lid on the gaiwan and then slide it to the side so there’s a gap of about one-sixteenth of an inch. Pour the tea out of this gap so that the leaves stay inside. Enjoy! 8. 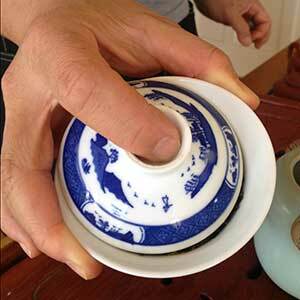 Refill the gaiwan with water and repeat process. A Yixing clay pot is recommended for aged Pu-erh as it provides the hot and closed environment some teas like in order to unfurl their best flavors. 1. Pour water over the pot, and then into the pot (starting with the outside and moving to the inside), then fill the pitcher and cups in order to heat them up. 2. Dump out the water. 3. Place your tea into the pot. 4. Add water to the pot until it slightly overflows. If there are bubbles, just scrape them off as you put the lid on. 5. After a few seconds pour out the water. This is the rinse, you do not drink this. 6. Lift the lid and pour water into the pot. Put the lid on and then pour water over the pot and lid. This is to keep the temperature of the pot as uniform as possible, which keeps the temperature of the tea steady. 7. Wait the appropriate amount of time. 8. Pour out the tea. Enjoy! 9. Refill the pot with water and repeat process. To optimize the flavor of the tea, refer to the chart below for recommended infusion times. Feel free to adjust the infusion time to suit your preference. If you use a bigger teapot, the infusion time should increase accordingly. 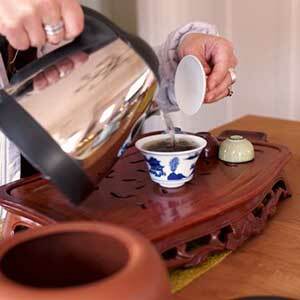 Pu-erh tea can be consumed by itself or mixed with flower teas, such as rose, osmanthus, or chrysanthemum. Flowers add a nice floral aroma and taste that makes the tea more interesting and enjoyable. Goji berries, high in antioxidants, may also be added to serve as a natural sweetener. 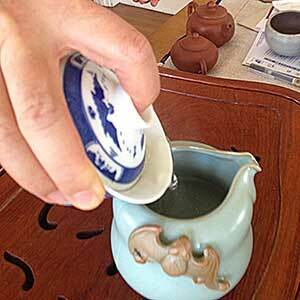 In warmer weather, clients have reported that cool Pu-erh can be very pleasant and refreshing. I encourage you to try and experiment different combinations to make your tea drinking experience more interesting and rewarding.